Padangokhala (once upon a time)…tili tonse…These are the famous opening lines of folktale sessions in Malawi. Children growing up in Malawi will recall that in the evenings they would all gather by the fireplace, listen to their grannies and elders narrate stories to them. While it was a source of entertainment, the folktales brought along with lessons about life, culture and traditions of life in Malawi. But with the dawn of other forms of entertainment, the folktales are slowly dying. In fact not many ‘modern’ grannies can narrate folktales to their grandchildren. A gap in cultural understanding is slowly taking shape among children in Malawi. It is for this reason that the Ministry of Education, Science and Technology (MoEST) reviewed the curriculum and introduced expressive and performing arts. And as a way of bringing in the much-needed teaching aids for the two new subjects, Nanzikambe Arts in conjunction with Rei Foundation Limited and Malawi National Commission for Unesco (MNCU) decided to bring back the folktales to students but in a different format; stage drama. “Apart from boosting lessons, these folktale stage dramas will help students to appreciate their heritage, culture and traditions,” said Smith Likongwe, Nanzikambe Arts board chairperson. He said the plays will be compiled and made available to students studying arts in both primary and secondary schools as a teaching and learning aid. “After lessons, students will have discussions based on the stories learnt and what they mean. This will boost their knowledge of our culture. So, we will be preserving our culture through these dramas,” he said. During the launch of the project on Saturday at Blantyre Sports Club, Nanzikambe Arts staged various plays with themes from Malawian folktales. Taking centrestage was a play titled Mfumu ya Dyera, whose main theme was teaching against serving two masters. 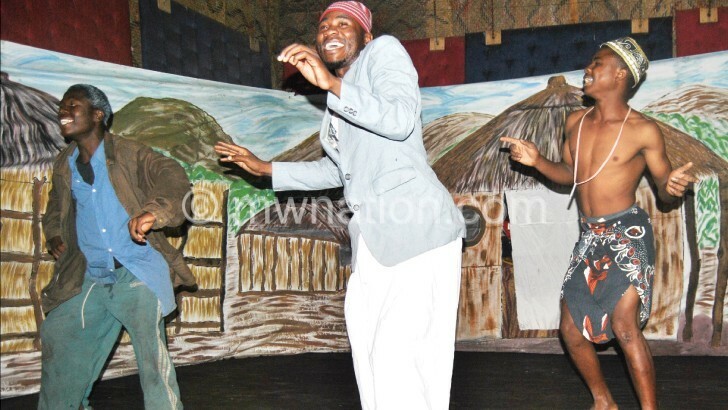 The play, which had Thlupego Chisiza taking the lead role of a chief who wanted to attend two parties on the same day but ended up missing the food and the fun at both, impressed the audience. It embedded messages of gender disparities, chauvinism and dishonesty. Then Chisiza led the audience in interpreting the lessons in the play. Deputy director for Malawi College of Distance Education in MoEST, Ruth Samati-Kambali, said as a ministry they are looking forward to having such entertaining lessons which will go a long way in preserving Malawi’s culture. “Malawi is rich in culture but many do not know because we have not had ways and methods of preserving these cultures,” she said. Samati-Kambali said MoEST realised that expressive arts are crucial; hence, the decision to incorporate them in the education curriculum. “But then, we realised that we did not have teaching and learning materials; hence, the importance of this project. The folktale stage drama will tell stories that were being told by our grannies to students,” she said. Samati-Kambali, however, said the teaching and learning materials will have to go through a vetting process before being adopted for schools. “I am optimistic that they will fulfil all the requirements,” she said. One of the arts students from Blantyre Girls Primary School, Gertrude Phiri said it is unfortunate that these days grannies no longer share nthano with their little ones. “I hope I can learn a thing or two from the stage drama. I am sure that they have taken the best folktales rich in lessons for us,” she said. Under the project, Nanzikambe has collected 257 folktales from throughout Malawi that are common among all cultural communities. Currently, there is a weekly folktale programme for children at the National Library in Lilongwe besides radio and television programmes on the same is broadcast on Timveni Television.